New Packages in 2019! When you purchase our weekly, monthly or season pass you will get access to ALL cards instead of just 1! You won’t have to wait for us anymore to customize the cards for you, as you will have access to print/change the cards at any time. All cards are 100% editable. Please take a look below and select the access pass that works best for you. As always, thank you for using ParlayCardsNow.com. 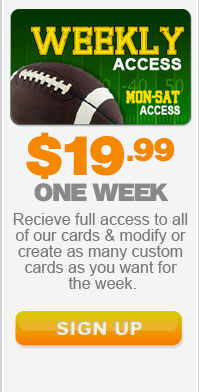 $19.99 – 1 Week Package – Receive access to ALL of our cards for 5 days. Print our NCAA Football, NFL and Combo card or simply the card of your choice. Change anything on the 3 cards to meet your desire. 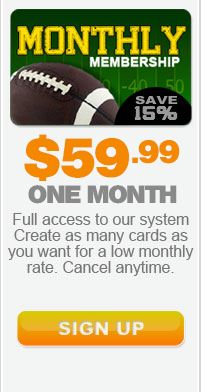 $59.99 – 4 Week Package – Receive access to ALL of our cards for 28 days. Print our NCAA Football, NFL and Combo card or simply the card of your choice. Change anything on the 3 cards to meet your desire. Season Package – $224.99 This package price will reduce by $15.00 after each week. Get access to all 3 of our cards for the entire football season (including playoffs & bowl season). Change anything on the 3 cards to meet your desire. $64.99 – Peforated Paper – (500 Sheets) – ** CLICK HERE TO ORDER ** This will allow you to print 1,000 cards with tear away tickets at the bottom. No more tearing and ripping off the bottom. Look professional to your clients with our perforated paper. Simply put the paper in your printer and print the PDF file directly to it for a perfect fit. We will ship the paper directly to your front door at no additional cost. The paper will be available in white paper only and have a detachable bottom for easy collection of tickets. By downloading any files off of this website, you agree to our terms of service. Must be logged in to download.